You are currently browsing the Bullwhip blog archives for January, 2008. 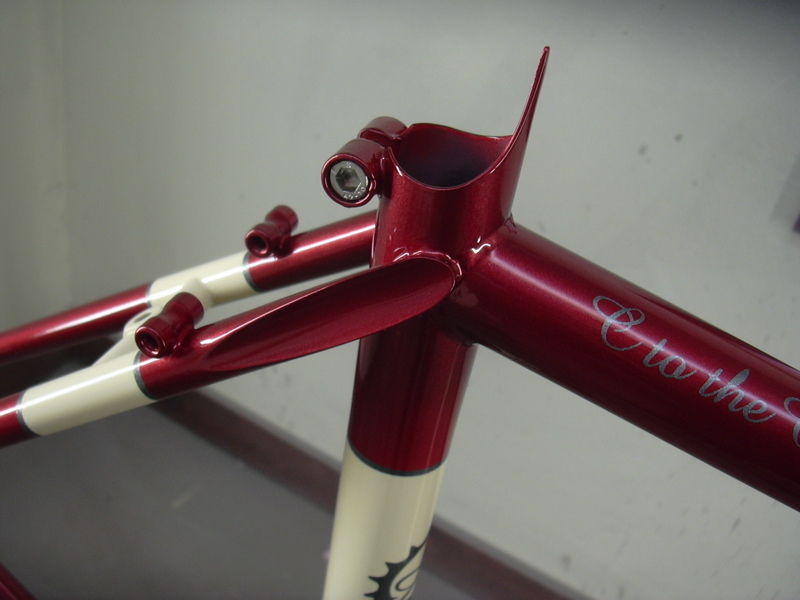 I just finished a bike for Providence luminary Carrie Cannon. It’s a commuter single speed, and in addition to being lovely in general, it’s a good example of a melange (if you will) of construction techniques. 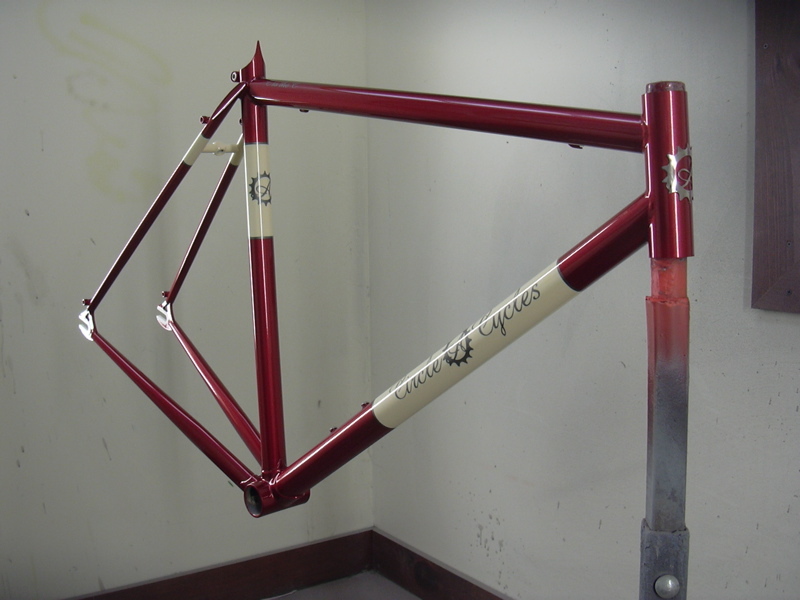 So what we have here is a frame with a welded front triangle, lugged fork and BB shell, and capped seat stays. There’s a lot going on at the top of the seat tube so let’s take a closer look, shall we? 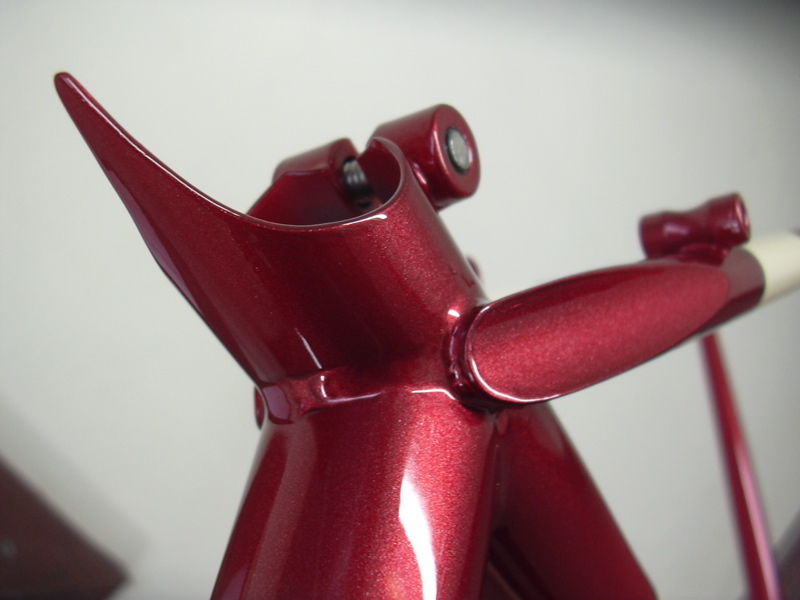 Also there you can see the mount for a rear fender. Carrie’s deciding on parts, I’ll post some more pictures of the complete bike hopefully next week. Garrett, our erstwhile partner and espresso machine tech, made this for stripping paint. 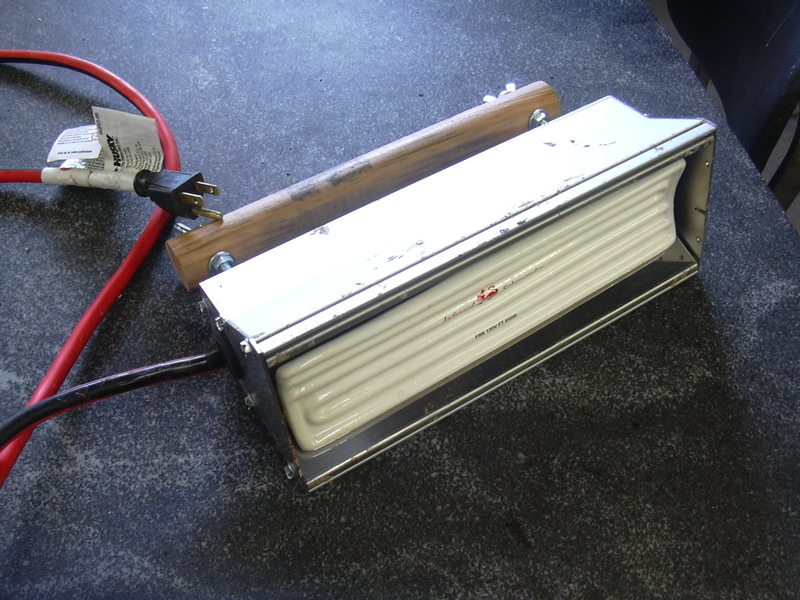 It’s an infrared heating element with a handle; for home use the idea is that it doesn’t get so hot as to vaporize the lead in old house paint. But it works great on bikes too. 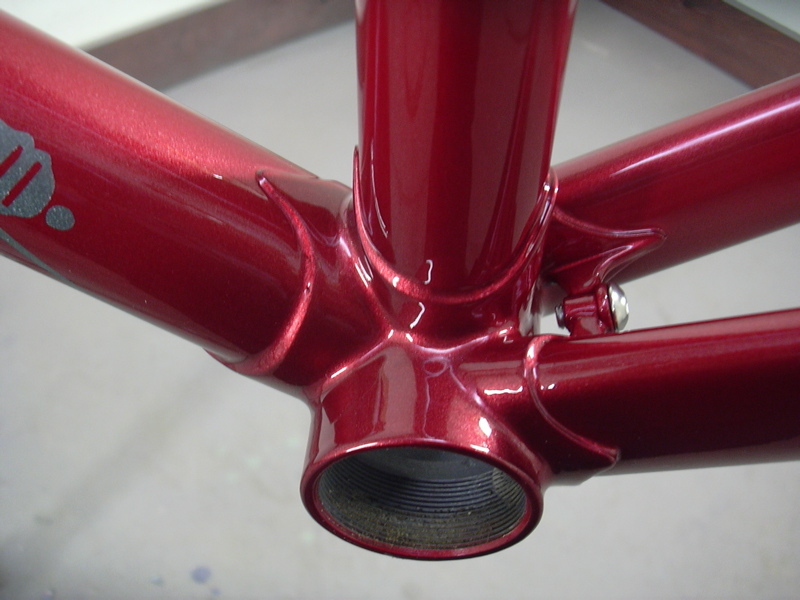 It gets the top coats soft enough to easily scrape, and from there we can abrasive-blast down to bare metal. It’s much nicer than nasty chemical strippers and you don’t have to worry about any of the stripper lingering on the frame. So if you send in your bike for a repaint this is the sort of high tech, kid glove treatment it’s in for. Before the holiday madness descended I did a repaint for our friend Patrick of Java Speed Scooters. 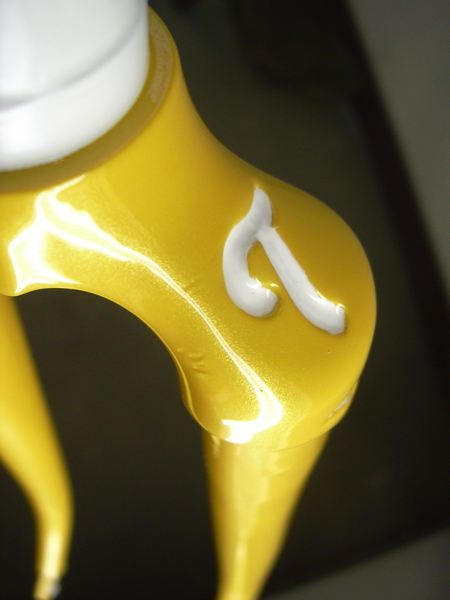 It’s an old Tommaso that we did a crazy yellow pearl paint job on. This is one of the better made frames that’s come thru here (the work of our own hands excepted, of course) – great detail work and tons of neat cutouts and embossings. You’d be shocked, shocked how nasty some of the vaunted classics of olde look when you get under the paint, but this is really a work of art. You can see more pictures here. Coming up: lisa rides, a new frame for hometown hero Carrie Cannon, stripping paint with invisible rays, and more!